The industry standard for lab animal identification. Traditional lab animal tagging techniques, like the standard metal ear tag, are simply inferior to the automated mouse ear tags on the market today. They take time to apply, they are prone to misapplication, and they can often come loose when the loop gets caught on something. Metal tags cannot be scanned and automated data collection is an impossibility. Metal ear tags are not compatible with MRI/CT, and they come in only one color. They appear confusingly identical to staff and reactions with animal tissue are commonplace. Ultimately the use of metal ear tags is a rather antiquated way of tagging mice and identifying lab animals. Now let's take a look at the revolutionary RapID Tags® design. They are secure, lightweight, and painless. They feature a 2-D Matrix Barcode, allowing for instant scanning with 100% accuracy. Processes will become automated and there are millions of possible unique codes to avoid confusion. 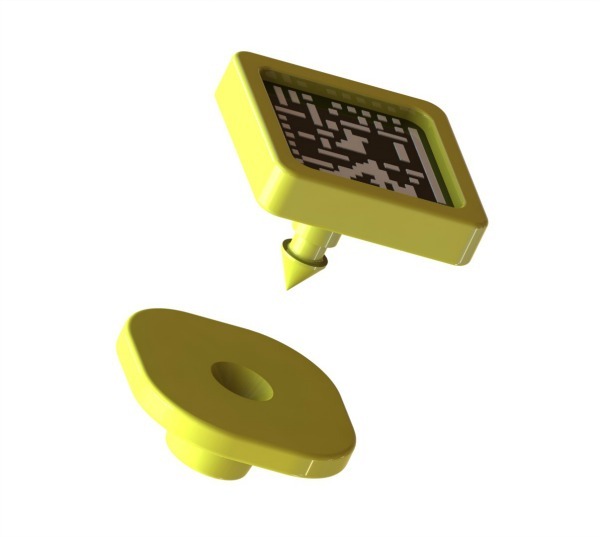 Instead of taking down information at an inefficient pace, these animal identification tags allow the ability to scan tag after tag in rapid succession. RapID Tags are inert, so there will be no harmful reactions with the lab mice. Their advanced polymer structure makes them almost indestructible. With just a small amount of training, staff can apply or remove them with ease. Furthermore, they are 100% autoclave and MRI/CT compatible, and made in the USA. These humane, automated mouse ear tags surpass less considerate methods. Thanks to the minimally invasive design, they cause a negligible amount of harm to the mice. This lessens the risk of infection and keeps the lab animals in a healthy state. They also give a research laboratory an advantage over mouse RFID transponders and P-Chips. Both methods require invasive procedures, which takes additional time and money. RFID is intrusive to the mouse, and doesn't allow for visual identification either. RapID Tags nullify all of those potential downsides, with the added benefit of being less expensive. This cutting edge technology is quickly becoming the industry standard for lab tags. Accuracy. The exclusive combination of alpha-numeric digits enables millions of unique ID numbers. The additional feature of the 5 distinct color choices further enables visual identification (no need to disturb the animal cages) and automatic matching to computer generated colored cage-card and specimen labels by way of an exclusive website application. Speed. The colored labels are easy to differentiate and allow for sight-only identification. The barcode ear tag enables the use of a scanner to record each specimen, reducing the time spent trying to do it by hand. Humanity. No need to put lab mice through undue stress. The rapid and minimally invasive application and removal process is painless. These features, in conjunction with the many ancillary benefits the automated ear tags provide, make RapID Tags a one-of-a-kind system that will provide the solution to all research laboratory animal ID needs. Copyright © 2019 RapID Lab, Inc. All rights reserved. RapID Tags® is a registered trademark of RapID Lab., Inc. RapID Lab products are covered under one or more U.S. and International patents-pending.